Bold and sophisticated, this beautiful bouquet is runway ready and synonymous with fashion icon Vera Wang. To impress someone special in your life who's deserving of a splendid arrangement of flowers, this bouquet is your answer. 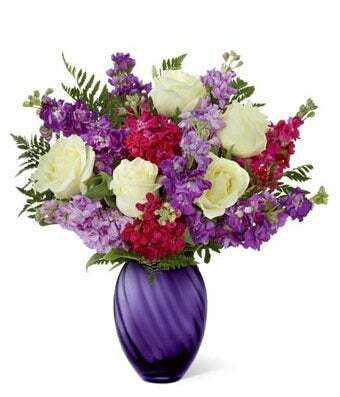 The fragrant smell of the purple gilly flowers will permeate the home and make your recipient smiling for days, all the while thinking how did she deserve such a grand gesture of a gift. Honor a special lady in your life for her birthday, anniversary or just because. Vase may vary depending on local florist's availability.